First, select the appropriate tab for the materials you would like to search: Catalog + OneSearch@IU Results, Catalog Only Results, or OneSearch@IU Results. Then type keywords, an author's name, or even a full title in the search box, and click Search. 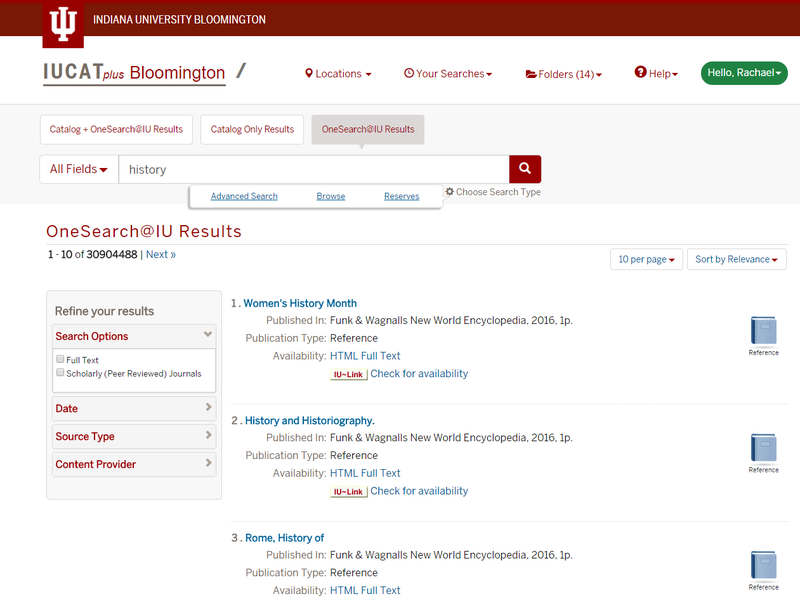 You must enter a search term to receive results in the IUCATplus "OneSearch@IU Results" view. 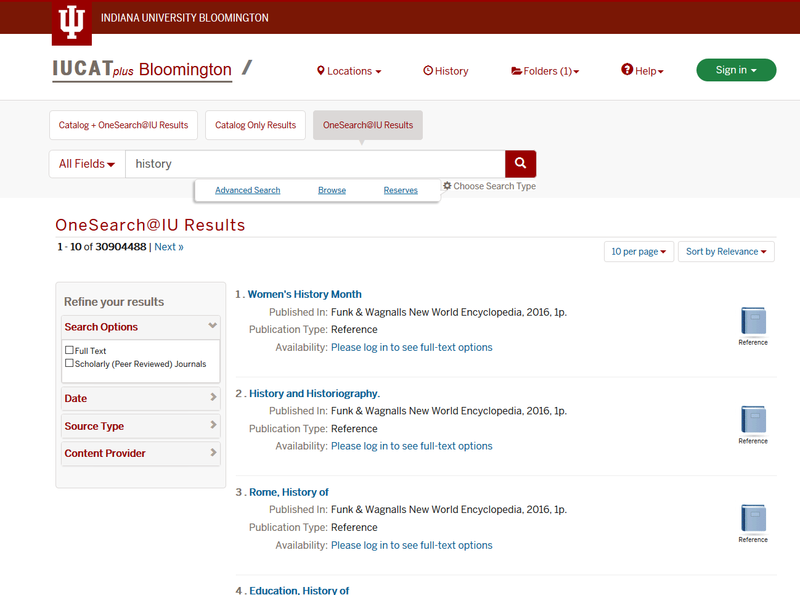 To filter results by author, format, publication date, etc., narrow your search to either "Catalog Results" or "OneSearch@IU Results Results". For more, see the Libraries at IU IUCAT articles. 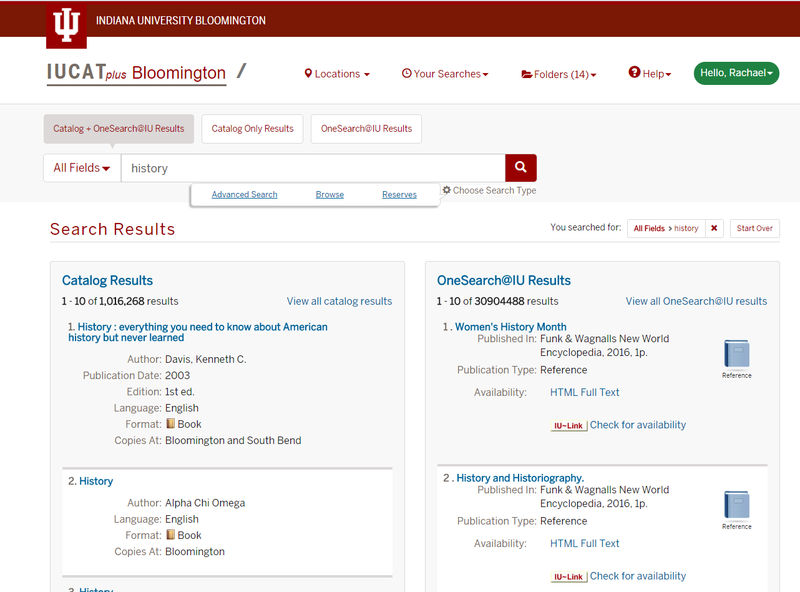 The OneSearch@IU Results search allows you to search across hundreds of scholarly article databases, news, and popular publications. You can refine your search using limiters found on the left of the search results. If you are affiliated with IU, you can access full text (if available) or link through to request items by interlibrary loan. Saved searches, search history, folders, and advanced search are available for catalog searches only. Many records have some kind of full-text option; what is available depends on library subscriptions and/or vendor availability of formats. Full-text formats include HTML, PDF, Epub and various e-book platforms. You may view full-text options if you are affiliated with IU Bloomington and logged in. To access the full text, select the link in the results list or enter the detailed bibliographic record. Due to publisher restrictions, some records cannot be displayed unless you are logged in. 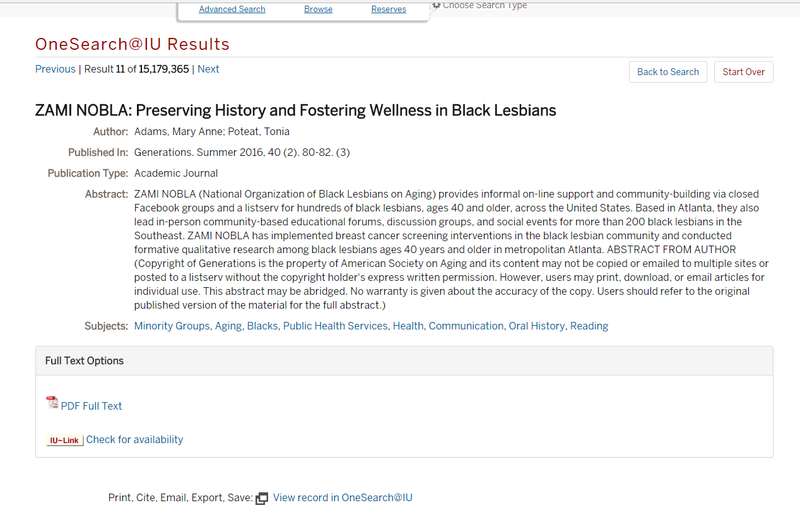 You may save, print, cite, and export articles within OneSearch@IU. Click the View record in OneSearch@IU link. Once you are viewing the detailed record in the OneSearch@IU interface, you may use the options found in navigation menu to the right of the detailed record information. This is document bfxs in the Knowledge Base. Last modified on 2018-11-28 12:03:00.